I've been mia from the blog for awhile, just dealing with a lot of anxiety issues and working on getting better. I've been in therapy for almost a year, and along with breathing exercises, meditation, and medication I'm slowly starting to feel like myself again. In my search for anxiety treatment I came across aromatherapy as well as what I mentioned above. 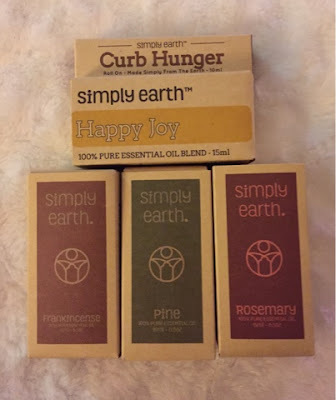 I had just started to look into essential oils when I just so happened to receive an email from Simply Earth about trying their subscription. It couldn't have come at a better time! 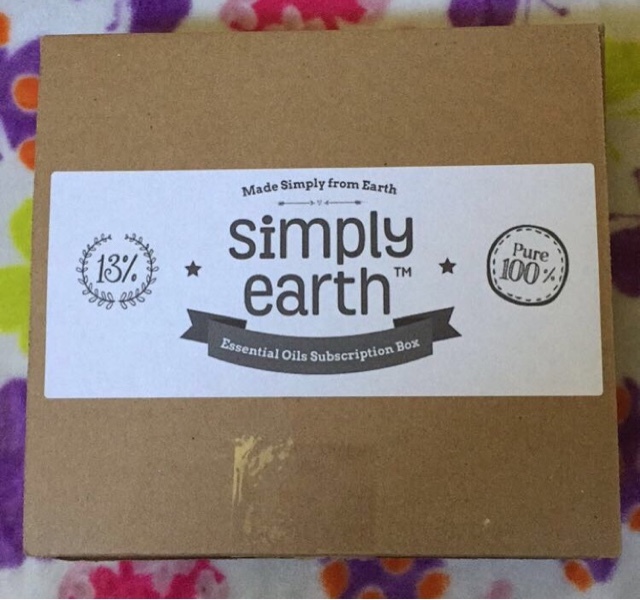 Simply Earth is a monthly subscription service for essential oils. 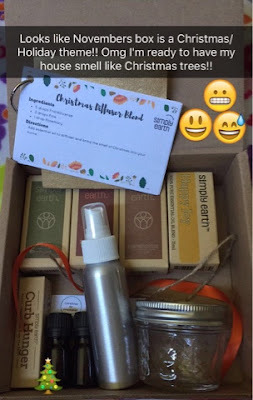 Every month you will receive a box with new essential oils. I received the November box. Every month there is a new theme for the box and Novembers box is a holiday theme! Every month you get five essential oils. 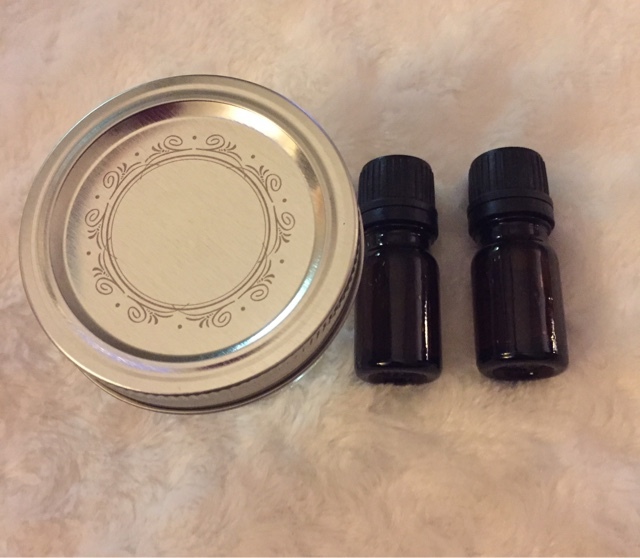 The oils in the November box include one to curb hunger, one called Happy Joy, Frankencense, Pine, and Rosemary. You also get extra goodies like extra bottles to mix your oils to your liking. And you get some cards with oil recipes and other fun craft ideas. Each box is $39 a month. I think it's a pretty good deal considering how much essential oils can cost. 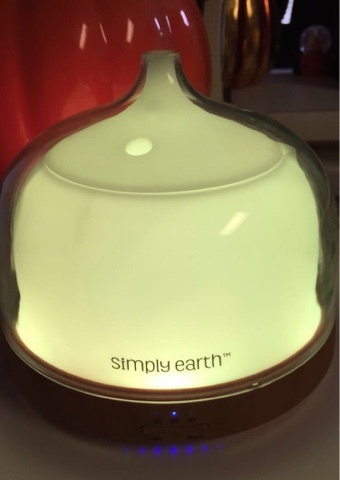 With the Simply Earth diffuser of course! And it changes color! From blue to green, violet, pink, and so on which makes it really fun. My kids actually love that aspect of it! It's very easy to use. You just fill the diffuser with water, put a few drops of your oils in, and turn it on. All Simply Earth essential oils are 100% pure! Another great thing is they give 13% of their profits to organizations that fight to end human trafficking! 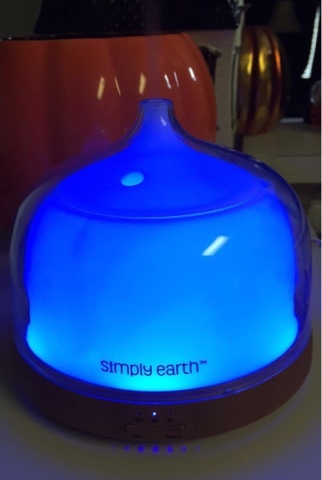 Now I'm not saying that Simply Earth claims to reduce anxiety by any means but having a warm soothing scent throughout my house is definitely calming to me. When I'm dealing with anxiety anything I can do to try and calm myself down naturally I'm all for, whether it be reading, listening to music, cleaning, or turning on my diffuser with essential oils. I have loved trying out all these oils. My favorites have been the Pine and Happy Joy. I love to mix these two specifically in the diffuser. They all smell nice. None of them smell over powering, although you really only use a few drops in the diffuser. These essential oils should last you quite awhile. With the holidays right around the corner this would make a great gift. If you're new to essential oils like me this would be a great way to start out. You get everything you need in your first order! 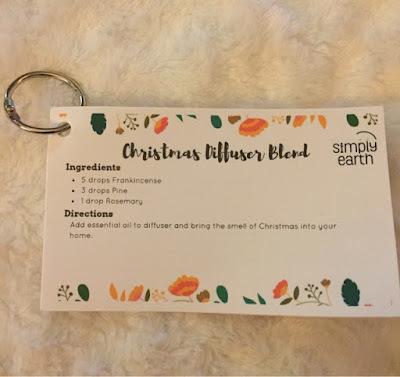 Including a FREE diffuser! When you subscribe to Simply Earth subscription add the diffuser to your shopping cart, then at checkout add the coupon code FREEDIFFUSER and you will receive the diffuser for free!! Shipping is free. You can cancel or pause your monthly box at any time. 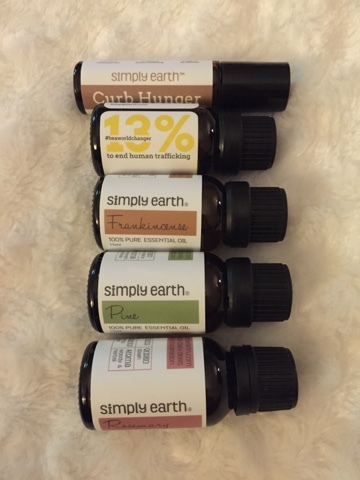 I really enjoyed the Simply Earth subscription and definitely recommend if you're into essential oils. Simply Earth here to answer any questions you have!